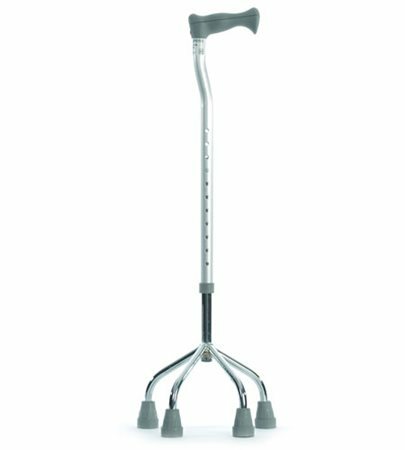 Walking Stick with Four Small Feet - Adjustable. 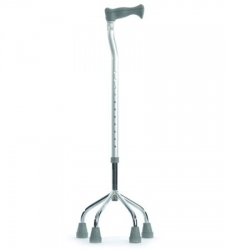 Another feature packed walking stick from Active Mobility Centre. This adjustable quadruped walking stick (walking stick with four feet) is styled as a traditional stick, but has the extra stability of a small base. It’s made from lightweight but sturdy aluminium – so will last – and has an angled neck so helps reduce strain on wrists. Can be height adjusted to match user’s height and posture. The non-marking slip resistant rubber tips will make sure that nasty accidents are avoided while providing the support you need.